Arizona became a state February 14, 1912, the 48th state admitted to the Union. The sun shines nearly every day in Phoenix, the largest of the capital cities. The land is flat desert, but it is surrounded by irrigated fields of lettuce, melons, oranges, lemons, and olives. Phoenix Mountains Preserve is a series of city parks that offer more than 23,500 acres of desert mountains – with hiking and biking trails, picnicking areas, and panoramic views of the city. 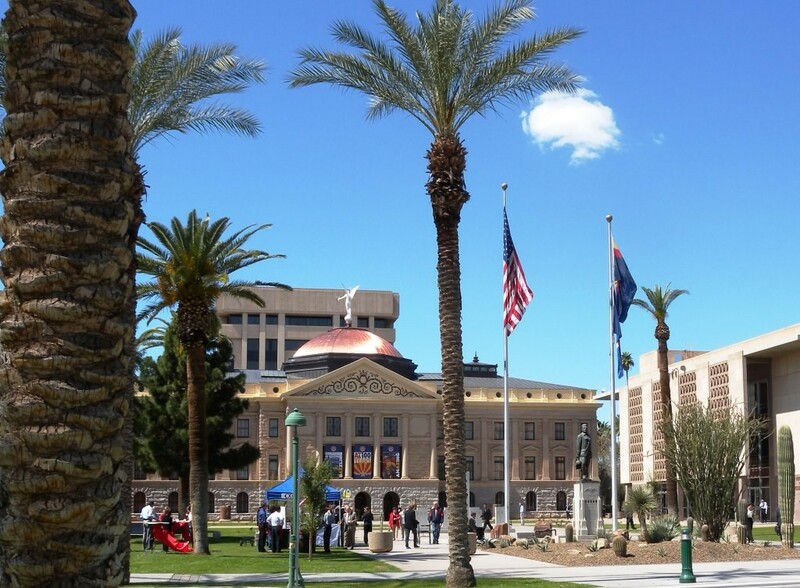 The capitol is built of native stone and surrounded by a large variety of native trees and cactus; you can see 150 acres of desert plants in Desert Botanical Gardens too. Pueblo Grande Museum and Cultural Park is a Hohokam archaeological site and ruin, occupied between AD 300-1450. Famous as a Spring Training spot for baseball, Phoenix is an informal but sophisticated warm and dry resort city. The Grand Canyon is to the north; two other national parks are Saguaro Cactus to the south and Petrified Forest to the east. The big wide palm-lined streets, the mountains jutting up all over town, the casual scene, the calm. Relax, enjoy the sun. The bougainvillea everywhere, even on the freeway walls. Mountains near: McDowell, White Tank, Superstition, and Sierra Estrella Mountains. Humphreys Peak in the north central part of the state is the highest point in Arizona at 12,637 feet.